An amateur player who was a second half substitute on his sole senior appearance. He played in the home match against Chester on 19 September 1914 but as Chester failed to complete their fixtures this match was deleted from the records. Hailing from Manchester he had played in the South East Lancashire League before signing for Macclesfield. Featured in pre-season matches but was unfortunate to be injured on his first match for the club against Chester. He faced stiff competition from the very experienced Harry Pearson for the left-back position and only featured occasionally when Pearson was unavailable through injury. A 6'2" amateur 'keeper made a single senior appearance in the 3-1 victory at a time when the club were looking for a second 'keeper. Michael only made this one appearance as shortly after the Altrincham match, Roy Dixon was signed as the club's second 'keeper. There is nothing recorded about this player other than he moved to the Moss Rose from Stafford Rangers. A member of the reserve side who had been playing well, given a taste of senior football. A member of the Macclesfield reserve team who made two early season appearances at senior level. David was born in Lye, West Midlands in May 1892 and joined Newcastle Town before moving to Brighton & Hove Albion (January 1913). He then signed for Sheffield Wednesday in March 1914 making 47 league appearances before moving to Stourbridge (August 1919), returned to Sheffield Wednesday (December 1919), Stoke City (May 1920) where he made six senior appearances, Llanelly (August 1921) and Rochdale (June 1922) where he made 209 senior appearances and scored 11 goals. He signed for Macclesfield Town in the summer of 1928 going straight into the team, and was one of the few players who missed very few matches throughout the season when there were numerous positional and personnel changes. He was captain of the team. David was left out of the side in March when he was in dispute with the club. At the time he had signed for Macclesfield he agreed to attend training sessions on Tuesday and Thursday, but around this time he was asked to attend on Wednesdays in addition. However, on the first Wednesday he was required to attend he was ill and did not attend, resulting in the club giving him 14 days notice to terminate his contract. David appealed to the Cheshire County League who upheld his appeal with the result that he was re-instated in the team. Jon started playing football with Barnsley Westend JFC and Barnsley Schoolboys before moving to the Centre of Excellence at Barnsley FC. He moved through the ranks at Barnsley where he earned his first professional contract going on to make 12 senior appearances. Spent time on loan at Hartlepool and York City signing permanently for York in March 2002 (78 pps, 15 goals). He signed for the Silkmen in February 2004. A tall, robust target striker, Jon did not disappoint starting the 2004-05 campaign in fine form scoring six goals in the first five matches, and went on to score 26 goals in all competitions in the season, a club record since Macclesfield were promoted to the Football League. The highlight of his season came when he hit a magnificent hat-trick in the 5–0 win against Notts County. Jon was a favourite of the fans and was affectionately christened “The Beast” by Andy Worth the PA announcer. After recovering from injury at the beginning of the 2005-06 season Jon continued his scoring prowess, and in such good form it was no surprise that he attracted the interest of several clubs culminating in a transfer to Hull City in January 2006 for an undisclosed fee which Jon states was £250,000 plus £150,000 add-ons. At Hull he made 52 appearances scoring 12 goals. Jon moved to Stoke City in June 2007 for a fee of £275,000 (39 apps, six goals), then to Preston North End on free transfer in September 2008 (109 apps, 31 goals), and in January 2011 to Cardiff City for a fee of £100,000 where he was basically a squad player (15 apps, two goals). During his time at Cardiff he spent time on loan at Doncaster Rovers, Huddersfield Town and Scunthorpe United. In the summer of 2012 Jon signed for newly promoted Football League club Fleetwood Town (64 apps, 22 goals), moved to Vanarama Conference club Forest Green Rovers in the summer of 2014 (163 apps, 41 goals) and signed for Newport County in the summer of 2016 (11 apps, four goals). Moved on loan to York City in November 2016 signing a permanent contract with them on 1 January 2017, gaining a winners' medal in the FA Trophy in May 2017. Author of his autobiography Feed the Beast. There is no information recorded about this player who made two appearances in each season, scoring on his debut in the 1-3 loss at Portsmouth Rovers who were based at Cliviger near Burnley. Derek played for Rangers for 10 years from 1970 to 1980. He won two championships, two Scottish League Cups and one UEFA Cup Winners’ Cup during his time there, and was capped by Scotland 12 times and gained one under 21 cap. On leaving Rangers he played for Leeds United, Manchester City, Swansea City, North Shore in New Zealand, Belgium Racing Jet, Rochdale and Airdrie, before signing for Macclesfield. On leaving Macclesfield was on the books of Curzon Ashton for the 1990-91 season. When he finished playing football Derek spent 23 years in the sportswear business, including working for Reebok for 10 years eventually retiring in 2014. There is no recorded information available for this player. From Brentford he was one of numerous players in the 1919-20 season given a trial. A young amateur who made his debut at the end of the 1954-55 season and then covered the outside-right position from the end of August to the middle of November 1955. His goals came in the 3-1 home victory against Mossley and the 1-1 draw at Altrincham. It was reported that he did not like wearing shin pads! Previously with Stockport and Rochdale, Colin brought a wealth of experience to the Moss Rose gaining a winners' medal in the Cheshire Senior Cup in 1973. He retired from football in May 1973 after which he worked at Nelstrops flour mill in Stockport. Whilst a schoolboy played for St Philips' Litherland near Bootle and on leaving school signed for Liverpool Tanning Co in the Liverpool Central Combination where he won a Championship medal. In World War One he joined the Royal Garrison Artillery in October 1914 serving with them until demobilisation in 1919. During this time he represented his regiment at Central Forces in both this country and in France. He sustained a slight injury during his war service. After the war he signed for Leeds for the 1919-20 season playing in their Midland League team. 1921-22 saw him at Runcorn when he was selected to represent the Rest of the League versus the Champions. He started the 1921-22 season at Stockport County playing in five Lancashire Combination matches before being promoted to their Cheshire League side. He moved to Macclesfield in December 1921 as a defender but completed the season at Inside-left. He proved to be a cool, effective player who was a fearless tackler, but missed the home match against Chester at the end of January as he missed his train. Away from football he ran a sweet and tobacconist business in Liverpool. Prior to joining Macclesfield had played at Stockport County and Northwich Victoria. During the Second World War he served in the RAF when he played for Cheltenham and was on the books of Grimsby. All his appearances came in the first half of the season with his goals coming in the 2-0 win at Chester and in the 2-1 victory at Wrexham, his last match for the Silkmen. Drafted into the Macclesfield side for the final two matches of the season, both against Buxton, when the committee were finding it difficult to raise a team. In the away match Macclesfield could only field 10 players; losing 10-0 at half time they refused to take the field for the second half with the match awarded to Buxton. Derek was appointed manager in mid March 1978 moving from Middlewich Athletic. He brought with him two Middlewich players including prolific scorer Rob Wheeler but he had insufficient time to have an impact on the Silkmen who finished the season third from the bottom of the Northern Premier League. The 1978-79 season started badly, including a 1-7 defeats at Mossley in the League Cup and 0-6 at Runcorn in the league, resulting in Derek being dismissed in September 1978. A member of the 8th Cheshire Rifle Volunteers team who appeared in the newly formed Macclesfield FC team. The following year he was awarded a Scholarship at Wadham College, Oxford. Brother of H Paul. A member of the 8th Cheshire Rifle Volunteers team alongside his brother FW Paul who, from the limited information available, played in the newly formed Macclesfield FC team. Came to Macclesfield having been on the books of Manchester North End, Bacup and Middlewich, but only played in three consecutive matches in a season when 10 different players were used for the inside-left position. Part of the youth section at Croydon, his first opportunity in senior football came at Sutton United, but after scoring six goals in 10 league appearances he was signed by Fulham, however, he did not make the breakthrough into their senior side although he appeared regularly for the youth and reserve sides. He signed for Gillingham in 2010 making 37 appearances for them, most of which came from the substitutes' bench and also had a loan spell at Braintree. He moved to Aldershot Town in 2012 but only made one appearances before returning to Sutton where he scored 15 goals in 47 appearances. Signed by Macclesfield during the January 2013 transfer window, he made one substitute appearance in the two weeks he was at the club before signing for Ebbsfleet Town towards the end of the transfer window. In the 2013-14 season he played for Ryman Premier League side AFC Hornchurch, signing for Dover Athletic in the summer of 2014 and moved to Barnsley in the summer of 2016. Went out on loan to Shrewsbury in January 2017 for the remainder of the 2016-17 season and signed a permanent contract with the Shrews in the summer of 2017. On transfer deadline day in August 2018 signed for Bristol Rovers moving to Shrewsbury Town on loan in January 2019. A former Huddersfield Town trainee, Steve made his debut for the Silkmen at the age of 19 in September 1994 at the beginning of a three month loan period with his move made permanent in December 1994. Steve enjoyed success in Macclesfield’s Conference days as a member of the Conference championship winning sides in 1995 and 1997, gained a FA Trophy winner’s medal in 1996, earned an England semi-pro call up and was Player of the Year for the 1995-96 season. Steve was a member of the Nationwide League Division 3 team which won promotion to the Nationwide League Division 2 as runners-up in 1997-98. Also gained a winner's medal in the Staffordshire Senior Cup in 1998. In Macclesfield’s first two years in the Football League Steve was the backbone of the defence, when he wore the captain’s armband for much of the time, always good in the tackle, possessed an excellent turn of pace and had the ability to provide pin-point crosses to the wings. In the summer of 1999 he moved to Chesterfield returning to Macclesfield for the final few weeks of the 2003-04 season when he brought stability to the back line. Having sustained a close season injury Steve did not play at all the following season and was released in April 2005. Steve moved to Northwich Victoria, Stalybridge Celtic and FC Halifax where, as captain, he led them to the League title in the 2009-10 season after which he retired from playing football returning to his carpentry trade in West Yorkshire. Drafted in from Leek at a time when different players were filling the centre-forward position, scoring the winning goal in his second match against Sandbach Ramblers. Said to be a tricky player who worked hard and won admiration. A teacher by profession, William trained at St John's College, Battersea where he played for the College team scoring over 100 goals in two years. He then played for Northern Nomads and Eccles Borough (Summer 1909) before signing professional forms with Sheffield United in January 1910, moving to Bury in July 1912. He saw war service in France in 1915 and was commissioned in 1917 but later that year he was wounded and returned to England. William assisted Stoke for a time but on demobilisation he returned to Bury where he was appointed captain of one of their teams. For the 1922-23 season he moved to New Cross (later named Manchester North End) where he captained their Lancashire Combination side. Signing for Macclesfield in the summer of 1923 he was appointed captain and only missed four matches throughout the season. Described as a cool and intelligent player he was also a good distributor of the ball. Returned to Manchester North End (Blackley) for the 1924-25 season. Was appointed Headmaster of Central School, Blackley, Manchester in 1928. There is no information recorded about this player who was probably given a one match trial. A native of Poynton he started his playing career at Cheadle Heath before moving to Horwich End where he gained a winners' medal in the Derbyshire Cup. He then played for Glossop and was on the books of Crystal Palace. He signed for Macclesfield in the 1913-14 season appearing regularly other than for a couple of spells in the 1914-15 season when he was injured. The first of these absences came in the home match against Barrow on 19 December 1914 when he was basically attacked by a Barrow player who was dismissed for his actions. Harry underwent an operation and the Barrow player was fined £4. 4s.0d (£4.20) of which £3. 3s.0d (£3.15) was paid to Harry to cover his medical expenses. In the War he served as a Naval Petty officer and was a Physical Training Instructor covering a wide range of activities: boxing, wrestling, ju-jitsu, swimming, bayonet fighting, sword drill, foil fencing, gymnastics, sports and games. After the War he returned to Macclesfield giving sterling service over many seasons, tackling with vigour and always frustrating the opposition. He was well known for cheerfully shouting to his fellow team members 'keep 'em out lads!!!'. In the 1919-20 season he gained a winners' medal in the Altrincham Cup. Harry was appointed captain for the 1922-23 season but relinquished the position later in the season. Whilst he appeared regularly in the 1922-23 season he was missing from the middle of March and in the 1923-24 season he was injured early in the match on 2 February 1924 and had to be admitted to hospital after which he did not feature again. Was playing for Eccles United in the 1925-26 season. Away from football Harry was a professional sprinter. A member of the youth set up at Rotherham United but was released in the summer of 2009. In September 2012 he signed for Leicester City who were then managed by his father Nigel. He spent time on loan at Carlisle United where he made his professional debut against Sheffield United, then Wrexham and Peterborough United but his contract was terminated by Leicester City in June 2015 following a controversial incident during the club’s promotional tour in Thailand having only made a single appearance for the Foxes. He then trained with Rotherham United before signing for Barnet in February 2016 going on to make 15 league appearances but incurred a knee injury during the 2016-17 pre-season which kept him out of contention for the whole season. On 4 August 2017 he joined Coventry City on non-contract terms but was released on 30 August without making any appearances. He then signed a deal with Kidderminster Harriers in September 2017 where he made 28 appearances in all competitions and scored one goal for the National League North side. Signed a one year deal with Macclesfield Town in July 2018. David had played for Bangor but moved, initially on loan, from Altrincham. He was a strong tackling and creative player who added stability to the team. Nathan was an apprentice at Preston North End before signing for Sheffield United. Injury hampered his progress with the Blades and, after a successful loan period, signed for Burnley for a fee of £60,000. Whilst at Burnley he went out on loan to Rotherham United, Mansfield Town and Doncaster Rovers but, along the way, there had been times when he was affected by injuries, however, he signed a permanent contract with Rotherham United at the start of the 1996-97 season but failed to make an appearance for them. Joined Macclesfield in January 1997. He made some appearances in the 1997 Conference championship season and then in the Football League, but the big striker lost his place following the arrival of new faces and moved to Winsford United at the end of December 1998 spending some time on loan at Stevenage Borough. Nathan later played for Northwich Victoria, Barrow (twice), Droylsden and Clitheroe finishing his playing career in 2001.
Pepper, who was a consistent scorer for the reserve side, was a speedy player with good ball control and a hard shot, made his appearances in the senior side at a time when Trippier had been dropped. His one senior goal came in the 5-2 victory at Congleton Town. He played in one senior match when he scored a goal to help the Silkmen gain a 3-0 victory. At the age of 13 was playing for Newcastle St George reserve team and then graduated to the senior side gaining a winners' medal in the North Staffordshire Church League Cup. For the 1917-18 season he moved to Silverdale Catholics during which time he appeared for Port Vale when they won the Sentinal Cup (a competition for under 21 players). He then moved to to Silverdale St Luke's for the seasons 1918-19 and 1919-20 where he was top-scorer with 29 goals in his second season with them. Signing for Macclesfield for the 1920-21 season, he played fairly regularly from September onwards although injury kept him out of contention from time to time. He was unable to match his goal scoring record at his previous club but was a plucky winger who had the ability to work well in a small space with good ball control and whenever he lost possession always tried to regain possession. On leaving Macclesfield he signed for Whitchurch in the summer of 1921 remaining there for two seasons and then moved to Winsford United for the 1923-24 and 1924-25 seasons. An attacking winger who is from Israel where he started his career at youth level with Maccabi Tel Aviv. In 2011-12 he played for Maccabi Herzliya before moving to Hapoel Ramat Gan in 2012 where he remained until 2016 when he moved to the UK. Had featured for Egerton (Knutsford) before signing non-contract forms with Macclesfield in December 2016. Opportunities were extremely limited with Omry making just two appearances but having signed dual forms with Hyde United made six appearances and scored four goals for them. Has represented Israel at Under 17 and Under 19 levels. Son of a local licensee, David was with Stoke in the 1975-76 season and then in the Cheshire League. Russ was an experienced and well known non-League player, who was signed from South Liverpool. A local teacher who played mainly for the reserves in his first spell, he then played for Northwich Victoria (twice) where he was top-scorer, Morecambe (twice), Walton & Hersham and Stalybridge Celtic before returning for the 1977-78 season as an elegant ball playing centre-forward. On leaving Macclesfield he was player/manager at South Liverpool, was a player at Witton Albion, Manager at Southport, played at Ellesmere Port & Neston and Prescot Cables before being appointed Manager at Skelmersdale, after which he was Manager/Director of Football at Burscough. In 2004 he was the Sports & Recreation Manager for Southport & Ormskirk Hospital Trust. Came to Macclesfield having been a member of Blackpool's Central League team, but only made five early season appearances prior to Norman being signed who then filled the right-half position for majority of the 1927-28 season. It would appear that Perry was given a two match trial when the team was in the middle of a 13 match spell without a win. Despite scoring in his second match Perry was not signed, nor does it appear that he was given a chance in the reserve team. Dave was signed from South Liverpool. He was a fast attacking winger capable of playing on either flank. At some time after leaving Macclesfield he returned to play for South Liverpool. A local player who made two end-of-season appearances. Signed for Macclesfield at the end of December 1930, he was a clever player who went straight into the side eventually taking the place of Harold Lievesley. On leaving Macclesfield played for Stockport Reserves (June 1931) but quickly moved to Mossley (September 1931) where he made 25 appearances scoring two goals. On leaving Mossley he moved to Witton Albion (October 1932), featured for Hyde United in the 1934-35 season, returned to Mossley and completed his career at Great Harwood (November 1936) retiring in 1939. Died 24 January 1968 in Salford. There is no information recorded about this player, but as he did not appear for the reserve team it is assumed that he was give a one match trial. A former member of the youth section at Bolton Wanderers, Mike then played for Skelmersdale United before signing for AFC Telford United in June 2013 where he played a part in their promotion campaign in the 2013-14 season. At the start of the 2014-15 season he scored six goals in 14 appearances before signing for Barnsley in October 2014 making two substitute appearances. Joined Macclesfield Town on loan from Barnsley in the middle March 2015 but was only called on to make three substitute appearances, on each occasion featuring on the right wing. On leaving Barnsley signed for Southport moving to Salford City in the summer of 2016 and returning to Southport in June 2018 on a two year deal, however he was released by Southport in October 2018 after which he announced his retirement. Started his career in the youth team at Crewe Alexandra but Macclesfield was Benny’s first senior club signing in 1978, featuring regularly in the reserve side and deputising for players in the senior side from time to time. On leaving Macclesfield he moved to Bury in 1980 where he made 14 senior appearances before joining Winsford United and then Stalybridge Celtic, Mossley (player of the Year 1982-83) and Witton Albion. He then went on to play for several other North West sides - Barrow, Buxton, Rossendale United, a return to Mossley, then Curzon Ashton and Droylesden. He moved into management filling the assistant manager's role at various times with Stalybridge Celtic, Congleton Town, Ashton United, and coached Mid-Cheshire League sides Grove United and Bramhall. He was then appointed manager at Mossley and later at Witton Albion. His managerial career then took him as assistant manager at Leek Town, Clitheroe and back at Witton where he was also the Commercial Manager. Next stop came at Bradford Park Avenue, following which he was first team coach under manager Steve Burr at Stalybridge Celtic and took over as caretaker manager on Burr's departure to Kidderminster Harriers. He was then appointed manager at Radcliffe Borough. Away from football, Benny used to own a Bingo Club in Hyde but sold it in 2005. From 2010 to 2011 Benny was Recruitment Consultant with TNG recruitment and since August 2012 has been Area Manager for Parcels 2 Freight Ltd. He has obtained Multisports Qualifications including SAQ & Course delivery as well as being a FA Qualified Coach. Has been an Online Football Show presenter, Ex Chamber Networking Host and has been captain of various Sports Teams. He has also represented Cheshire at Football and The North West at Swimming. A member of the Youth section at Stoke City from 2006 to 2009, whilst never making an appearance for Stoke's senior side he spent time on loan in 2008 at Alfreton Town and Stafford Rangers. Signed for Burton Albion in the summer of 2009 where he made 137 appearances in all competitions spending his final month as a Burton player on loan at Alfreton Town in 2015. He then moved to Gateshead in the summer of 2015 making 17 appearances but with the appointment of a new manager he was surplus to requirements leading him to sign an initial one month loan deal at Macclesfield Town in February 2016. A speedy winger who, at Macclesfield, only appeared once in the starting line-up against Torquay United and also made two late substitute appearances. Returned to Gateshead at the end of his loan, immediately being loaned to Altrincham. Released by Gateshead in May 2016. Having been without a club since being released by Gateshead signed for Mickelover Sports in the summer of 2017. Featured fairly regularly for the senior side during the first half of his single season at the Moss Rose, and also played for the reserves. Peter was a junior at Stoke City and played for Northwich Vics before signing for the Silkmen from Eastwood (Hanley). His two cup goals came in the 5-2 home win against Kirkby Town in the First Qualifying Round of the FA Cup. A vastly experienced striker who played for many league clubs. His career started at Sheffield United in 1983 where he remained until 1988 (80 league appearances, 20 goals). Whilst there he spent time on loan at Rotherham United. On leaving Bramall Lane he had brief spells at Oldham Athletic (fee £25,000) and Preston North End before signing for Bolton Wanderers in 1989 for a fee of £50,000 (141 league appearances, 51 goals) remaining there until 1992. Next stop was Peterborough United (fee £85,000) in 1992 (43 league appearances, 15 goals) before moving to Burnley (fee £80,000) in 1994 (40 league appearances, nine goals). Whilst there he had a short spell on loan at Carlisle United in 1995. In 1995 he signed for Cardiff City (fee £60,000) where remained until 1998 (61 league appearances, 5 goals). Tony spent time on loan at Hailfax Town before his loan spell at Macclesfield for the final few months of the Silkmen’s first season in the Football League. During his short time at the Moss Rose he was used mainly from the substitutes’ bench and scored just one goal in the final match of the 1997-98 season, which was Tony's last professional match of his playing career. On his retirement, Tony joined Oldham Athletic where he has enjoyed roles with the youth team, reserves and was Ian Dowie’s assistant when he was manager. Following Dowie's departure to Crystal Palace, Tony reverted back to working with the youth teams and as Oldham's Academy Manager. In both 2005 and 2013 he had short spells as caretaker manager at Oldham. At the beginning of the 2016-17 season was appointed Youth team manager at Oldham and was later appointed Head of Development. Towards the end of his playing career Tony was a referee for two years progressing as far as the Northern Premier League. Originally from Portsmouth Rovers, but playing for Norman Athletic when he was one of several players tried out by Macclesfield in forward positions throughout the season. He scored his league goal in his second appearance in the 2-0 home win against Chester. Was with Chester in the 1921-22 season. Previously on the books of Bristol Rovers and was with Macclesfield during the 1937-38 season, however, he only played twice at senior level in consecutive matches during the 1938-39 season scoring on his debut in the 2-0 win. Replaced Richie Mitchell in the 1-0 home defeat by the Welsh side. An amateur player from Leek who was a member of the Silkmen reserve side and was brought into the senior side for the penultimate match of the season as cover. There is no information recorded for this player whilst at Macclesfield but it is believed that he played for Langley FC during the 1882-83 season. A local player who had represented Macclesfield Modern school before playing for Prestbury Club and Poynton. In addition, he made three appearances for the Hallefield team between 1899 and 1900 making quite an impression on his debut in April 1899. (Local Club Hallefield had taken over the Moss Rose in 1897 when Macclesfield FC had failed financially.) He then moved to Stockport County for three years where he was captain during his last two years there, although it has not been possible to establish for which team he was captain. Moved to Blackpool in August 1903 where he remained until 1905 but only appears to have made a single appearance for the senior side. He then signed for Macclesfield. Percy gave sterling service to the club for 10 years, initially at right-half and from the 1910-11 season at right-back making over 300 appearances. He was described as a tower of strength and ever-present for five seasons, however, he had signed for Burslem Port Vale in June1906 but returned to Macclesfield for the fourth match of the 1906-07 season. Missed a couple of matches through injury shortly after and missed several weeks in the middle of the 1910-11 season, again through injury. Was appointed captain for the 1912-13 season when Macclesfield were members of the Lancashire Combination. It seems that he retired from playing in 1914 but was persuaded to return until he joined the forces at the end of the 1914-15 season. At this time he had a connection with a junior team at Broken Cross. A member of the Manchester & District League Championship sides in 1909 and 1911 and was a holder of a winners medal in the Cheshire Senior Cup 1911. During his career bids were received for him from Liverpool and Derby County, but he declined them because of business commitments as a textile designer, an occupation he maintained throughout his playing days. A young local player from the Junior Unionists brought in for one match towards the end of the season. A member of the Macclesfield reserve team, he deputised for Howard Bushby for two matches. A native of Radcliffe represented St Thomas', Radcliffe before signing for Rossendale United (April 1908) and then Salford United (January 1909), Oldham Athletic (May 1910) and Llandudno (September 1926) where he represented the Welsh League against the Cheshire league. Signed for Macclesfield in the summer of 1927, he went straight into the side appearing regularly in matches until the middle of October 1927. He scored his one league goal in the 3-0 home win against Altrincham in September 1927. Died 23 November 1945 at Bury. Commenced his career at Stone Dominoes before becoming a youth player at Everton where he was promoted to the senior ranks in 1998, however, he did not make any appearances for Everton but made his senior debut whilst on loan at Exeter City in 2002. Signed for Port Vale in 2003 where he went on to make over 250 appearances in all competitions, remaining there until 2008 when he moved to Luton Town making over 150 appearances in all competitions. A move to Mansfield Town in the summer of 2012 has seen him only making a handful of appearances due to a hip injury but George spent time on loan at Forest Green Rovers at the start of the 2013-14 season. Signed on loan for Macclesfield Town in February 2014 from Mansfield Town featuring regularly for the remainder of the season as a useful central defender. His two goals came at the end of February in the away matches at Woking and Hereford. Signed permanently for Macclesfield in the summer of 2014. George was a regular in the starting line-up throughout the season at centre back and quickly becoming a favourite of the fans for his strong and measured performances. He formed a centre back partnership with four different players during the season: initially with on loan Luke Waterfall, which proved to be a formidable duo, next on loan Liam Hogan, and when he was injured and returned to Fleetwood Town young on loan Alex Grant became George's third player to partner him and lastly Thierry Audel. His performances were recognised when he was voted Supporters' Player of the Year for the 2014-15 season and jointly as Players' Player of the Year with Rhys Taylor. The 2015-16 season saw George again at his very best as a central defender only missing eight matches throughout the season. His strong performance was recognised when he won a hat-trick of end-of-season awards: he was voted the Supporters' Player of the Year, the Players' Player of the Year and the supporters' web site Wraggs to Riches Player of the Year. Continued as 'Mr. Reliable' throughout the 2016-17 season. George yet again proved to be a strong defender only missing a few matches towards the end of the season when manager John Askey rested players in order to complete a backlog of fixtures. A rarity for George is scoring goals but this season he added one to his records in the 2-0 win at North Ferriby United at the end of January 2017 - his first strike since March 2015. Recognised by the fans for his abilities as a central defender George was voted Player of the Year for a third successive season which is believed to be a club record. A stalwart of the defence again in the 2017-18 season forming an excellent partnership with fellow central defender Keith Lowe although he missed several matches through injury, nevertheless, still made a significant contribution to the team helping them to become champions of the Vanarama National League for the 2017-18 season. During the season made his 600th career appearances (all clubs, all competitions). Retired from playing at the end of the 2017-18 season. George followed former Macclesfield manager John Askey to Shrewsbury Town where he was appointed first team coach but, along with John Askey, was dismissed on 12 November 2018 following indifferent results. Holds a degree in Sport and Exercise Science. The reserve team right-back, an amateur from Bollington, made six early season appearances when different players were being tried out in this position. Macclesfield's reserve team goalkeeper at this time played in three consecutive matches when John Wilkinson seems to have left the club and before Burbidge was signed. With him in goal the team were successful drawing one match and winning two. Started his career in the youth sections of Whitwell and then Cresswell Colliery. He then played with several local sides whilst working as a miner before seeing active service with the Sherwood Foresters in World War 1. Having been wounded in the war he went to play for Whitwell Discharged Soldiers where he was spotted by Sheffield United who signed him on a professional contract in January 1920. During his time at Sheffield, Jim was given a one match trial by Macclesfield in November 1922 but, at that stage, was not signed. He remained with Sheffield but could not establish himself in the side on a regular basis, incurred an injury at the start of the 1923-24 season and was released on medical grounds in the summer of 1925 having made 55 league appearances. After leaving Sheffield he took time out from football for the whole of the 1925-26 season. Having signed for Macclesfield during the summer of 1926 he went straight into the side at the beginning of the season playing at centre-half for the first five matches before Frank Knowles signed for the club. He moved to right-half in the middle of September 1926, a position which he held regularly only missing a few matches in the final two months of the season. The first of his three goals came in the opening match of the season, a penalty in December 1926 against Middlewich and the winner in a seven goal home match against Witton Albion at the beginning of March 1927. Played in the first three league matches in the 1906-07 season scoring three goals and also in the first round of the Cheshire Senior Cup in October which was his last appearance for the Silkmen. 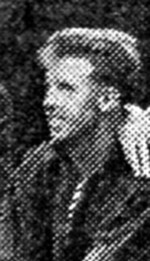 There is no information recorded about this player who must have left the club as Sammy Mitchell took over the outside-right position for the remainder of the season. Moved to Macclesfield from Coniston initially playing in the reserve team. As a hard working player he was promoted to the senior side in December when Tommy Jones was out injured taking over the left-half position which he retained to the end of the season. (When Jones recovered he was moved to the forward line in a season when various players were being tried out in forward positions). He moved to Mossley for the 1922-23 season. There is no information recorded about this player who was probably one of many players given a one match trial during the 1911-12 season. As an eighteen-year-old Mike spent a month on loan from Manchester United playing in two matches when Alan Zelem was unavailable. The first, his debut, resulted in a 1-1 draw, but the second was the FA Trophy first round 2-0 home defeat by Gretna who were then members of Division One of the Northern League. Mike went on to make over 570 career appearances at several League clubs including Lincoln City, Darlington, Rotherham United (where he made almost 200 appearances), and Wigan Athletic for whom he signed in 2005. Along the way three clubs, Notts County, Sunderland and Rotherham United, each paid a fee of £75,000 for his services. Even at the age of 33 he commanded a fee of £200,000 on his transfer from Rotherham United to Wigan Athletic in 2005. Whilst at Wigan had loan spells at Ipswich, Burnley and Barnsley. Mike retired from playing at the end of the 2013-14 season when he was appointed goalkeeping coach at Wigan Athletic but was released in January 2017 on the dismissal of Gary Caldwell. Appointed goalkeeping coach at Rotherham United in January 2017. Eric served in the RAF when he played for Liverpool reserves and captained RAF representative teams. He was signed by Macclesfield from New Brighton reserves when Foxcroft had left the club at extremely short notice. He endured an eventful debut being knock-out but having recovered was injured later in the match and had to leave the field (with Bardsley taking his place in goal). He recovered to play in the next two matches when he conceded 10 goals. He lost his place when Johnny Liddle was signed. Hailing from Nuneaton, Jordan was signed by Coventry City from former Sky Blues boss Gordon Strachan’s Rugby-based football foundation in April 2016. He was a prolific scorer at the Foundation with 39 goals to his names in 37 appearances, where he was on day release from school before embarking on a BTEC Level 3 full-time study programme in September 2015 and had trials with Hibernian, Stoke City, Doncaster Rovers and Cambridge United. Given a two-year professional contract on signing for Coventry, he went on to play for the Under-18s and the Under-23 sides making his senior debut on 8 August 2017 in the EFL Cup against Blackburn. Highly thought of at Coventry he signed a new four year deal in September 2017 with the option of a further year. Already a favourite with the fans they have come up with a song for him – ‘Come on Ponticelli…Score some goals for City and we’ll go wild, wild’. With other strikers available at Coventry and budgetary matters to consider, Jordan signed a season-long loan with Macclesfield Town at the end of August 2018. Unfortunately Jordan incurred an injury during his debut and returned to his home team Coventry to recover. Having recovered, Jordan returned to Macclesfield and made two substitute appearances and one start in December, but was injured again fracturing the same bone after which he returned to his home club without having been able to make any impression with the Silkmen due to injury. Having learnt his football as a schoolboy in Market Drayton, he joined Stoke City as a youth and then signed for Port Vale as a part-time professional. After National Service he returned to Port Vale but as a full-time professional. Having made 50 senior appearances at Vale he moved to Macclesfield where he made up for his lack of inches with his agility. Later played for Werrington, Staffordshire. He was employed as a motor mechanic. Had been on the books of Norwich City and Cardiff City and played for RAF representative teams. He spent a month on loan from Bangor City, for whom he had scored 32 goals, as a further attempt to solve the problem of a position where there had been many changes and experiments. With Northwich Victoria from 1888. Whilst there, due to his amateur status regulations allowed him to play for more than one club and he represented Chirk in two Welsh FA cup winning sides on 18 April 1892 and 3 April 1893. Signed for Macclesfield in September 1893 but only made three appearances before returning to Northwich Victoria in October 1893 and then moved to Crewe Alexandra representing them in the Football League in the 1893-94 season. On retiring in 1896 he became the Druids' trainer (having played for them in earlier years) but soon became involved in refereeing and organising junior soccer in Denbighshire. He also served for many years on the management committee of various leagues and was a parish councillor. His refereeing career saw him progress to the Combination League and he took charge of three Welsh Cup finals and ran the line for international matches. In September 1935, his service to Welsh football was recognised with a testimonial fund. At international level, represented Wales against Canada in the autumn of 1891. Died 10 February 1940 at Acrefair, near Wrexham (his place of birth). Note: Known as Postles at both Macclesfield and Northwich Victoria but his registration with the Football Association of Wales is recorded as Postle. The former England Under-21 international started his career at Birmingham City as a trainee graduating to the professional ranks in July 1992 where he made 32 appearances in all competitions scoring two goals. Whilst at Birmingham he spent a short time on loan at Wycombe Wanderers before signing for Stoke City for a fee of £75,000 in December 1993 (54 appearances and one goal). He moved to Southampton for a fee of £250,000 in July 1996 where he found it difficult to break into the senior side on a regular basis only making 10 appearances. In February 1997 he was signed by West Bromwich Albion for a fee of £300,000 (47 appearances) spending time on loan at Northampton Town (October 1997 - 5 appearances) and Reading (December 1999 - 5 appearances) before moving on a free transfer to York City in July 2000 where he established himself making 131 appearances scoring eight goals. A move to Boston United followed in July 2003 (15 appearances). Graham signed for Macclesfield in February 2004. A left-sided defender, Graham’s performances were soon appreciated by the supporters especially his overall defensive abilities, his quality crosses and, at the same time, his willingness to track forward which allowed him to score six goals in his second season. However, despite performing consistently he was released in the summer of 2005 when he retired from professional football. After leaving the Silkmen, Graham graduated from the Open University in Social Sciences and gained a master degree in Leadership & Emotional Intelligence, and became the Football Development Manager at the University of Hull. Following the University’s International Office linking up with the Ghana Football Association, Graham was appointed a Technical Director to the Ghana Women’s National side for the duration of the 2007 Women’s World Cup tournament and travelled to China to coach the players. At the same time he was assistant coach to the England Universities squad. He moved to Leeds Metropolitan University in July 2008 as the Football Coaching manager where he remained until January 2011. He then signed initially a three-year contract as coach to the Swedish Division 1 club Ostersunds FK. With Potter still in charge, In October 2015 Ostersunds FK gained promotion to the Swedish top flight for the first time in the club's history. Further success came when the club qualified for the Europa League competition in the 2017-18 season having won the Swedish Cup, reaching the first round of the knock-out stage against Arsenal. Whilst they lost 3-0 at home, in the second leg they were victors by 2-1, unfortunately going out of the competition with an aggregate score of 4-2 in favour of Arsenal. Graham returned to the UK in June 2018 having been appointed manager at Swansea City signing a three-year deal. A young local player given a trial when he took the place of Titley who was injured. Alan never appeared regularly for the senior side, such that his appearances were spread over the time he spent at the Moss Rose. Alan also made two appearances for Witton Albion at the beginning of the 1976-77 season. Started his career at Wellington Scouts, Northwood Mission and Stoke City before singing for Port Vale in 1945. National Service interrupted his career such that he could only play regularly from February 1952, however, he made 281 league appearances and scored three goals. Reg helped Vale win the Third Division North Championship in 1954 and reached the FA Cup semi-final in the same year. He moved to Worcester City before signing for the Silkmen in 1960. A clever positional player, he appeared in every match in the 1960-61 season until February 1961 when he lost his place and only made one league appearance in the 1962-63 season. Died 23 January 1996 aged 63 at Hartshill, Stoke-on-Trent. Signed for the 1902-03 season. The first choice centre-forward for the majority of the season, but with only two goals to his credit it would seem that he lost his place in the middle of March 1903. From the Crewe District Poulson was signed for the 1904-05 season. He went straight into the team and would appear to have played in the majority, if not all, matches throughout the season. Would appear to have been with Crewe Alexandra during the 1906-07 season. Ken was a local player who was a member of the reserve side. Played for the local side Windsmoor and as an amateur first played for Macclesfield at the age of 17. Like his brother Ken, Philip was a member of the reserve side. His two goals came on his debut and in the following match at Runcorn. A young player who came from the Potteries youth side, he was given a taste of senior football when several young players were used after the Silkmen had clinched the League Title. He scored in the 1-1 draw. A member of the club's reserve team. A member of the reserve team. Prior to joining Macclesfield Gary had made over 100 Football League appearances at Lincoln City, Scunthorpe United, Wigan Athletic and Bury. 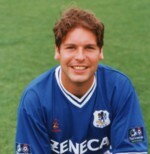 He then moved to Altrincham in the summer of 1993 but signed for the Silkmen on transfer deadline in March 1994. His two league goals came in the 1-0 home victory against Welling and in the final match of the season, a 1-1 draw at Northwich Victoria. Gary gained winners' medals in the Conference League Cup and Staffordshire Senior Cup in 1994 when he was introduced from the substitutes' bench in both competitions. On leaving Macclesfield in the summer of 1994 he went on to play for Welsh Clubs Bangor City, Rhyl, Flint Town United, Conwy United and for five years at Total Network Solutions where he made almost 150 league appearances scoring 26 goals. Gary was first-team coach at FC Chester from June 2010 to January 2014. Prior to joining Macclesfield Phil enjoyed league experience with Crewe Alexandra, but the majority of his career had been spent in semi-professional football, including a spell at Northwich Victoria where he was the youngest player to appear in a FA Trophy final. He had also played abroad with Sleima Wanderers in Malta leading to his nickname ‘The Maltese Falcon’. 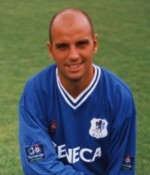 Phil joined Macclesfield in October 1993 from Stalybridge Celtic and became one of the leading scorers. A tricky striker, who was always fast on the ball, adept at twisting round opponents and could always score from opportunist positions. Phil earned semi-professional honours for England, a FA Trophy winner’s medal in 1996 and was an integral part of the two Conference Championship sides in 1995 and 1997. Also gained winners' medals in the Staffordshire Senior Cup in 1994 and 1997. Having enjoyed success in Macclesfield’s non-League days, it was unfortunate that Phil had to compete with other players in the 1997-98 season although he still gained a winners' medal in the Cheshire Senior Cup competition in 1998. Unable to command a regular starting place, resulted in Phil leaving the club in the summer of 1998. He went on to play for Altrincham, Radcliffe Borough, Bacup Borough and then spent time as assistant manager of FC United of Manchester. In the summer of 2013 Phil was appointed joint manager with Barry Massey at Salford City and later was appointed sole manager but was dismissed in January 2014 after a series of poor results. Phil works as a residential social worker for Salford City Council in children's homes. Thought to have been a member of the Macclesfield Reserve team who played in the final match of the season. Gil's first involvement in football came at Manchester City (hence his aversion to Manchester United and anything red) but it was in the Non-League scene that he played his football as a centre-forward and left-winger at the likes of Witton Albion, Winsford Unuted and Bangor City. At the end of his playing days Gil spent 12 months as the National Coach for the Armed Services in Saudi Arabia based in Jeddah where he leant to speak Arabic. He had also travelled as a scout for Graham Taylor when he was manager at Aston Villa. He first teamed up with Sammy McIlroy as his assistant at Northwich Victoria and then Ashton United. He came to Macclesfield in May 1993 as Sammy McIlroy's assistant but over the eight years he spent at the Moss Rose he held several roles. As Sammy assistant the team enjoyed significant success winning the Vauxhall Conference twice, Promotion to Nationwide League Division Three and the following season promotion to Division Two. They won the Conference league Cup, the Cheshire Senior Cup twice, Staffordshire Senior Cup twice, the Championship Shield three times and the Umbro FA Trophy played at Wembley. Even though he was assistant to Sammy, over time he took on the roles of Youth Development manager, Director of Youth Development and Director of Football. It was during his time as Director of Football that he was appointment manager when Peter Davenport decided to leave the club at the end of December 2000. Under his guidance the team completed the 2000-2001 season in 14th position. In October 2001 he stepped down from the managerial role to concentrate on his other responsibilities. During the summer of 2002 the club decided that due to financial constraints (they were still reeling from the loss of the failed ITV Digital company) they could only offer Gil a part-time contract and wanted to move him from a 'Football' Contract which included a specified length of time to a 'commercial' contract with a month's notice by either party. Gil felt that the workload required could not be achieved in the restricted hours and elected to leave the club. This was a sad day for the supporters as he readily gave his time to them and never failed to speak to the fans at away matches. His forte always was, and always will be, spotting young talent and scouting overall, and his post-match notes on every single opposing player whilst at Macclesfield were brilliant as they were concise yet complete. He was appointed Centre of Excellent Co-ordinator at Oldham Athletic with some involvement in scouting. After Sammy McIlroy had resigned from the position as manager of the Northern Ireland International Team he was appointed manager at Stockport County in November 2004 which led to a reunion with Gil who was appointed Chief Scout remaining there for just over a year until Sammy stepped down as manager. Since then Gil has concentrated on scouting for various clubs including Plymouth Argyle, Sheffield United (May 2006 to June 2011) and Blackburn Rovers (July 2013 onwards). He is also an International Freelance Consultant providing individual player and team assessments worldwide and an International Consultant for Scout7 Ltd providing player assessment worldwide. Jack moved from Sedgeley Park to Everton in 1937 as an amateur but was promoted to the professional ranks in 1938. He served in the Second World War, and on his return he played for Everton’s Central League side. Signed for the Silkmen in October 1946, he instantly won favour by virtue of his stylish and clever play. He was one of the finest backs in the Cheshire League at that time and made a big difference to the Silkmen’s defence. His positioning, anticipation and kicking were of the highest order and he always put his heart into the game. Signed from Rochdale, but otherwise there is no other information recorded about this player. Ryan spent six years at Stafford Rangers completing a record 320 consecutive league appearances, where he also collected four England semi-pro caps. In 1994 Barry Fry made a successful £40,000 bid for Ryan which took him to Birmingham City where he was involved with the team when they won the old Second Division and the Auto Windscreen Shield. He moved to Macclesfield in November 1995 for a fee of £15,000, where he became the first choice ‘keeper and along the way earned two further semi-pro England caps, a FA Trophy winners medal in 1996, was an important member of the 1997 Conference championship side and gained a winners' medal in the Staffordshire Senior Cup in 1997. Ryan was a fearless ‘keeper who kept 20 clean sheets, in all competitions, in the 1997-98 season and played with £20,000 worth of titanium plates and screws in his face following an on-field accident at Southport the previous season. Was a member of the Nationwide League Division 3 side which won promotion to Division 2 as runners-up in 1997-98. In the same season he gained a winners' medal in the Cheshire Senior Cup. He did not fare as well in the old Second Division at a time when the team as a whole found life difficult, and in his final season at the Moss Rose, Lee Martin came onto the scene to replace Ryan but, in his last match, he came on from the bench to make his 100th League appearance before moving to Telford United and later Stafford Rangers. Ryan was a Sales Account Manager supplying refuse disposal vehicles and is now Trash UK business development director. Chris was an Everton trainee moving to Chester City in September 1994 where he remained until moving to the Moss Rose in the summer of 1999. A regular in the starting line-up, Chris was an integral part of the midfield, always using his experience to the full and worked tirelessly from box to box. His ability to move forward enabled him to contribute several useful goals including two late goals in the home victory against Carlisle United, the second of which was the last goal to be scored in the 20th century by a Football League player. Chris has since played for League of Wales sides Bangor City and Colwyn Bay from where he retired from playing to become a delivery driver for a leading pharmaceutical company. A young player living in Oldham who was discovered and tutored by club captain James Burridge. Filled the centre-forward role from late November to the end of December 1931 scoring on his debut, but lost his place when the free-scoring John Jepson was signed. Initially played for his local village club Ipstones before joining Port Vale in 1944 remaining there until 1948, although in the whole of his time there he only made 29 league appearances scoring seven goals. During his time at Vale he played at West Bromwich Albion and guested at Crewe Alexandra. He was released by Port Vale in February 1948 when he moved to the Moss Rose. He only featured in two matches for the Silkmen, finishing on the losing side on both occasions. On leaving the Silkmen he played for Simplex Creda. Ken was signed for a fee of £200 from Wrexham where he had spent four seasons. He was described as a clever ball player and a schemer and from October 1949 to the end of the season he filled the inside-left position on a regular basis. He scored two goals on his debut in the 5-1 home victory, with his single goal in cup competitions scored in the 4-2 victory against Winsford United in the semi-final of the Cheshire Senior Cup. Appeared regularly in the first half of the 1958-59 season joining Witton Albion at the beginning of the 1959-60 season. 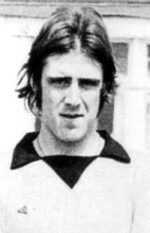 Andy’s football career started at Reading in 1971 (five league appearances), after which he moved to his home town club Buxton, and then Mossley in September 1972 (10 appearances) before returning to Buxton in October 1972. He moved back into the Football League with Sheffield Wednesday for the 1975-76 season (15 league appearances). He was then on the books of Norwich City in 1976-77 (one league appearance) and Hereford United in 1977-78 (11 league appearances), however he was unable to establish himself at any of the Football League clubs. He returned to Buxton in 1978 for a short time before moving to Port Vale in November for a fee of £1,000, but after five consecutive games he had not solved Vale’s problems at that time and moved back into the non-league scene with Stafford Rangers. Andy signed for the Silkmen in 1980 and whilst he was an attacking player, he did not always do himself justice and was transferred to Matlock Town before returning to Buxton for a third time. Spent time in Finland with Kuopion Palloseura FC in 1982. Played in only one match in the 1947-48 season but featured regularly from September 1948 to the beginning of April 1949.